INDIANAPOLIS, IND. (October 26, 2017) — Klipsch®, a tech-driven audio company and wholly-owned subsidiary of VOXX International Corporation (NADAQ: VOXX), today announces the debut of its Reference™ Theater Pack. The compact 5.1 surround sound system is the only horn-loaded pre-packaged surround sound system available today. It incorporates the same legendary acoustics, premium materials, and advanced technology as the revered Klipsch Reference series of speakers. Bridging the gap between convenient sound bars and complex home theaters, the Klipsch Reference Theater Pack is a seven-piece 5.1 surround sound system that delivers a full cinematic experience. Each system is comprised of four satellite speakers for full cinematic surround sound, a dedicated center channel that provides clear dialogue, a wireless subwoofer for room-filling bass, and a wireless transmitter that allows for versatile subwoofer placement in any room. “This is the easiest way to get award-winning, powerful Klipsch Reference home theater sound. It’s the complete system in one compact package ­— just add an AV receiver,” said Kerry Geist, product manager at Klipsch Group. The Klipsch Reference Theater Pack delivers superior acoustic performance by leveraging premium materials and advanced technology. The satellite speakers and center channel feature 3.5” copper Injection Molded Graphite woofers and ¾” aluminum Linear Travel Suspension tweeters for minimal distortion and enhanced, detailed performance. Exclusive Tractrix® horn technology delivers impressive high-end response and powerful dynamics. The all-digital subwoofer features a down-firing 8” woofer and port, plus a 150W high-efficiency digital amplifier for deep, clean bass. Not only is the wireless subwoofer easy to place in any room, each satellite speaker has a keyhole mount and a ¼” x 20 threaded insert for additional mounting options. 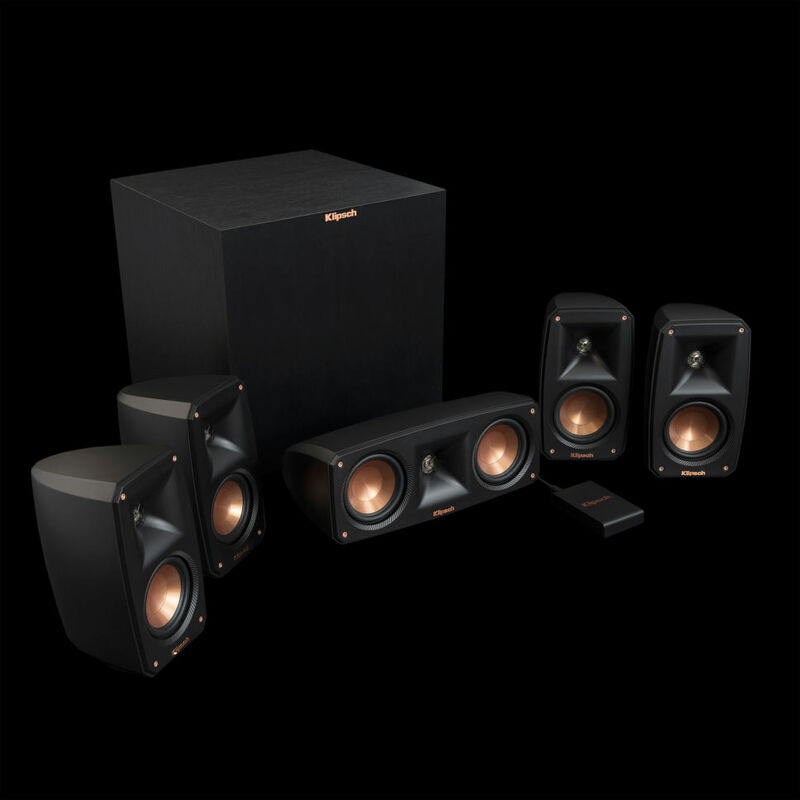 The Klipsch Reference Theater Pack (U.S. MSRP $999) is available in a black brushed polymer finish. It is available now at select retailers and at Klipsch.com. For more on the Klipsch brand and the Reference Theater Pack, visit Klipsch.com.